Our car show is gaining popularity! If you come PLEASE STAY AND PARK. We routinely see about 10 show cars pull in, turn around and leave – even when we have a decent number of cars parked. People don’t usually start rolling in until 6:30 so please don’t be discouraged if there are only a few cars if you show up early. This event is to help fund a new playground for the beach picnic area. Painting Class Starts Thursday, August 3rd at 6:00pm! Starting Thursday, August 3rd whether we are still running the car shows or not, we will be also be hosting a painting class at the Sports Chalet. Along with the painting class we will still have Concessions along with a 50/50 Raffle. Join us at the Sports Chalet for an evening of art and fellowship. 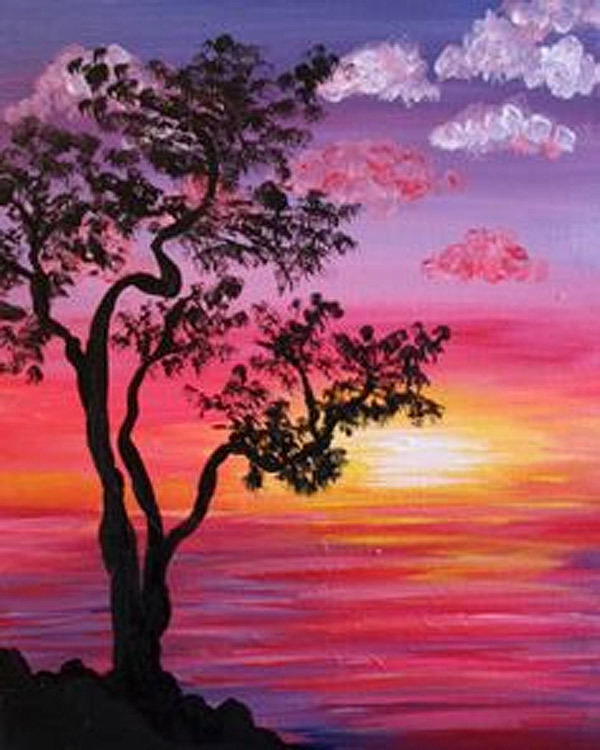 We will be painting a Sunset Silhouette on 11” x 14” Canvas, instructed by local Artist, Debra Warren Miller. You do not have to be an artist to participate at the “Painting at Punderson” event. You will receive step by step instruction, and all materials to achieve a beautiful piece of artwork. The painting is broken down into parts, which makes it easy for you to achieve. The Chalet will have concessions available and there will be a 50/50 raffle during the event. Pre-Registration is recommended; all those who pre-register by July 31st will be entered into a drawing for a FREE painting class during the next session! Contact Kathy for more details 440-227-4976, president@friendsofpunderson.com.You may also message us through the Friends of Punderson Facebook page.